Images like this restore my faith in this troubled land. Can you comprehend the brilliance of this image? Can you pinpoint what makes this display capital A Art? Don't just skip to the end, really think this through. It's a tough call. The obvious answer is the banana slices in the jell-o block. That is wrong. Others may point to the violently generic Milk Carton with minimal side decoration. Some may favor the compartment plate that not only prevents flavor contamination but also keeps the pea pile primed and pert. Rarer is the eagle eye that points out the double napkin provision, ensuring ample wiping surface (an often overlooked but crucial element for achieving total relief during eating). 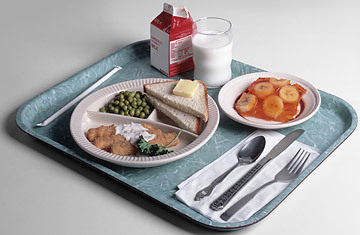 All of those are valid, but what really makes this photograph of a bland, institutional cafeteria tray meal Utterly Outstanding is... THE WRAPPED WHITE DRINKING STRAW OFF TO THE SIDE The damn thing is still in its factory-fresh paper sleeve! Untouched, uncrinkled, unfolded! Its ends are still fluffy! And it's dry! No sign of moisture discoloration and staining. It's perfectly safe to touch and use and drink from. OR NOT! The choice is yours. And as so far as the beverage component is concerned, you have nothing but options! You can drink from the glass like a man. You can drink straight from the carton like a man. OR, you may unwrap that straw and savor every last drop of cow milk without ever disturbing the placement of the drinking glass in relation to the tray's upper edge and the dessert dish's western curve! OH THANK GOD, SPATIAL RELATIONS ARE NOT A WORRY AT THIS TABLE! You can even dismiss all of the above, knock the glass over, throw the plate at your neighbor, stuff the jell-o down your shirt, use the tray to bludgeon the nearest guard and go after the warden with the fork. The photographer allows us that freedom. And Thank God For It. Images like this restore my faith in this troubled land. Can you comprehend the brilliance of this image? Can you pinpoint what makes this display capital A Art? Don’t just skip to the end, really think this through. It’s a tough call. The obvious answer is the banana slices in the jell-o block. That is wrong. Others may point to the violently generic Milk Carton with minimal side decoration. Some may favor the compartment plate that not only prevents flavor contamination but also keeps the pea pile primed and pert. Rarer is the eagle eye that points out the double napkin provision, ensuring ample wiping surface (an often overlooked but crucial element for achieving total relief during eating). The damn thing is still in its factory-fresh paper sleeve! Untouched, uncrinkled, unfolded! Its ends are still fluffy! And it’s dry! No sign of moisture discoloration and staining. It’s perfectly safe to touch and use and drink from. OR NOT! The choice is yours. And as so far as the beverage component is concerned, you have nothing but options! You can drink from the glass like a man. You can drink straight from the carton like a man. OR, you may unwrap that straw and savor every last drop of cow milk without ever disturbing the placement of the drinking glass in relation to the tray’s upper edge and the dessert dish’s western curve! OH THANK GOD, SPATIAL RELATIONS ARE NOT A WORRY AT THIS TABLE! You can even dismiss all of the above, knock the glass over, throw the plate at your neighbor, stuff the jell-o down your shirt, use the tray to bludgeon the nearest guard and go after the warden with the fork. The photographer allows us that freedom. And Thank God For It. Thank you for this one. I love you.